Our five-day stay in Sofia Bulgaria was always planned to be a rest stop after the intense week-long marathon of our Fez Travel tour of Turkey. As I’ve always said, you need to schedule in some downtime during a long holiday – you can’t always be ‘on the go’, out exploring new neighborhoods, trying new foods and meeting new people. Sometimes you just need to be in your rental apartment, watching a movie and eating pasta – that’s specifically why we paid a little more than we normally would for accommodation as we wanted somewhere a bit bigger and better equipped for a more comfortable stay. Still, I didn’t quite expect to spend as much time within our apartment in Sofia as we actually did. K was still nursing his cold after two weeks and he had finally passed it on to me, so we spent the first three days of our five-day stay in Sofia dosed up on cold medicine, hermited in our apartment watching the Star Wars series in preparation for watching The Force Awakens. On the first day we went out, we headed north of the city to the bus station to buy bus tickets for the next leg of our trip to Skopje in Macedonia. A lot of people said that we could buy them on the day of travel but as I tend to get a bit anxious if there’s no confirmation, we bought them two days early. We timed our outing to coincide with lunchtime as we wanted to get out to try some Bulgarian cuisine – luckily a pretty highly-rated restaurant called Hadjidraganovite Kashti (different in Cyrillic!) was located close to the bus station. The restaurant dates back a hundred years to the time of a wool trader called Hadji Dragan who built an inn in Sofia, inspired by all the different inns he had visited over the years around Bulgaria. The exterior of the restaurant is still decorated in the style of the time with displays of traditional Bulgarian costume, wooden carts, and more. As we walked in, I was relieved to see that all the diners were locals – sometimes TripAdvisor isn’t the best guide for local restaurants as it’s curated by tourists, but that wasn’t the case here. The menu was incredibly comprehensive, spanning almost fifteen pages of meat, vegetable, salad dishes, not to mention desserts and drinks. It’s worth spending some time on their website beforehand to peruse the menu, in case you’re like me and you get struck with indecisiveness when given too much choice at a restaurant. We ordered some drinks to start – a Bionade for K (also comes in 0.3 litre and 1 litre quantities) and a Fresh Orange Juice for me. My OJ was exceedingly sweet so I suspect they may have sweetened it with some sugar syrup. Interestingly, K’s bionade was the complete opposite, and was exceedingly sour, even for K who tends to prefer his lemonade on the sour side. This ends up working out well though, as many of the dishes we ordered were quite heavy and rich and we needed the crisp sour lemonade to cut through the richness. Believe it or not, this is actually a salad in Bulgaria – a Kalugerska Salata to be precise. While there’s a significant lack of leafy greens on the plate (a solitary decorative lettuce leaf really doesn’t count), I can’t fault the taste of the dish itself. Soft beans, sour gherkins, sharp onions and smoky roasted chutney is a brilliant combination that hits every tastebud – it’s just not what I would call a salad. I think this bean mix would be amazing on toast though, perhaps with some aged cheese melted on top as a simple, hearty lunch at home. 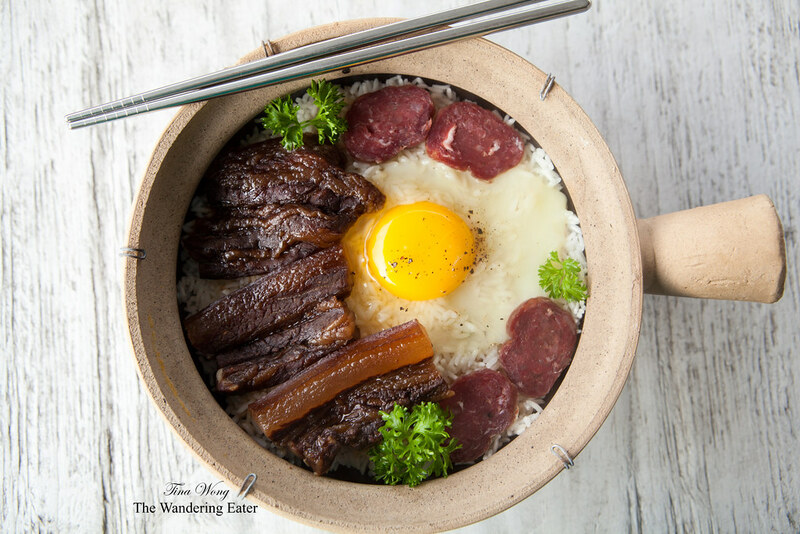 We ordered the Troyankso Tiganche as our first main dish – a dish oddly reminiscent of Chinese five-spice gravy beef! The wine sauce was really quite thick and almost gelatinous in texture, and extremely rich and dense in spiced flavour as a result. The beef was extremely tender, and had really taken on the strong garlic aromas of the sauce – no doubt the whole dish had been cooking for hours! Our second main dish was the Kavarma po radomirski – a claypot dish that called to me as it sounded not dissimilar to Chinese claypot with pork and egg (something like this)! Unfortunately it wasn’t quite what I was hoping for – this pork and vegetable claypot was a lot oilier and richer than a standard Chinese claypot – it actually needed something like rice on the base to soak up all the excess oil and sauce. We ended up leaving a full inch of sauce on the base, and needed to desperately cleanse our palates after finishing this oily claypot. We finished off the meal by ordering dessert to share – a Banitza with Orange Syrup. Banitza is a very typical Bulgarian sweet pastry that’s made of eggs and cheese sandwiched between layers of filo pastry. This version soaked in a sweet but tangy and refreshing orange syrup was absolutely divine, and much tastier than having it plain the way it’s normally served. I could have easily eaten more of this banitza! …oh all right, we didn’t finish off the meal with the last dessert. It was so delicious that I decided I wanted to try something else off the dessert menu, so we ordered the Cake with Yoghurt Cream as a final hurrah after we’d finished everything else despite the fact that we were absolutely full to bursting. I’m glad we ordered this – the spiced walnut sponge cake combined with the tangy yoghurt buttercream was an absolute winner, and is one of the dishes I’m determined to master on our return to Australia! Hadjidraganovite Kashti (what a mouthful) is, by popular reckoning on TripAdvisor, one of the best restaurants in Sofia. By my reckoning, I think it must be the restaurant serving the largest menu of traditional Bulgarian food, offering their diners plenty of choices – even those with dietary requirements won’t have any issues finding something to suit them here. The desserts are by far the highlight for me and I highly recommend ordering at least two desserts if you visit. Just keep in mind that the main meals can be quite heavy, oily and dense – so perhaps try ordering a few smaller lighter appetisers instead if you don’t want to end up waddling out the door with a heavy stomach! Hadjidraganovite Kashti is located at 75 Ulitsa Kozloduy in Sofia, Bulgaria.